LaserSoft Imaging once again demonstrates pioneering spirit with the production of “Advanced Targets” for Scanner Calibration, more measuring fields and increased Target accuracy. For many years now, Scanner-Calibration has been subject to the IT8-Standard. Scanner-Calibration measures the individual color recognizing capabilities of a scanner and creates a unique Color-Profile. 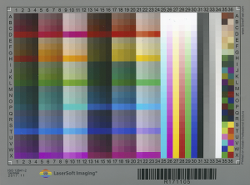 The generated Color-Profile helps software with color management, ensuring that images maintain their color-integrity on a wide-range of devices (e.g. monitors and printers). The ISO-Norm 12641 is part of the IT8-Standard. The ISO-Norm 12641 is currently being expanded by the ISO-Committee, in order to do justice to the steadily increasing importance of color accuracy. We at LaserSoft Imaging are very impressed by the reliable precision of these Advanced Targets and have already begun Advanced Target production. These 12641 (-2 ISO-Candidate) Advanced Targets will be offered in our Online Store until 01.06.18 at a special introductory price. Click here to view the complete press release or click here to be taken to our Scanner Calibration page to find out more about our new “Advanced Targets”.